How do I tell jobs to not use an old logo for the company I am at? Who manages the images and or company names? Many companies in the developer story dropdown list, like thyssenkrupp System Engineering, were seeded from Crunchbase before we launched. The data we obtained from Crunchbase were company names, websites, and logos. Currently the companies in the developer story are not connected to the companies in stackoverflow.com/jobs/companies. Linking the developer story companies to jobs company pages is something we plan to do in the future. 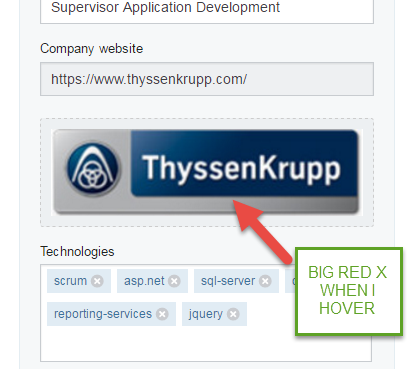 For now, if you would like to change the name, website, or logo of your developer story item, you can press the x button in the Company input field to unlock the fields. I went ahead and updated the logo for this company. Not the answer you're looking for? Browse other questions tagged discussion bug status-bydesign status-planned developer-story . Edited company name in CV, but my profile still shows old company name? What if you don't want a “Developer Story”? Publicly available careers CV silently made private? How to handle company rebrand/rename in Developer Story?